Had a capital and operational cost that was considerably less than current market solutions? Was more affordable to communities with limited budgets? Took up a much smaller footprint? Gave treatment results that met or were below new Federal and existing provincial regulations? Was modular and could be installed in steps to suit budgetary constraints? Could retrofit an existing system or be a stand-alone new system? Biofilm is a natural aggregation of a complex community of microorganisms growing on a solid substrate. 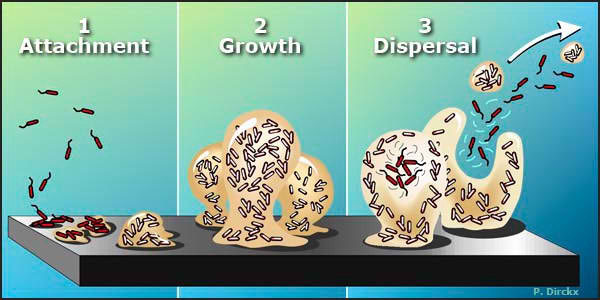 Biofilm technology works in three stages: attachment, growth, and dispersal. Biofilm is very resilient against toxic shock and hydraulic surges since communities are able to grow larger and insulate themselves. The older a biofilm gets, the more resilient it becomes, therefore the goal of BioCord is to create these older, larger communities by creating a “condominium” for the bacteria. BioCord™ is a substrate specifically for wastewater treatment using biofilm technology to biologically remove nutrients. This substrate allows symbiotic layers of different bacteria to develop, mirroring the process that occurs in nature. BioCord Reactors treat polluted water in oceans, rivers, lakes, as well as from municipal and industrial sources. The structure of BioCord maximizes surface area for biofilm development, while our integrated aeration system optimizes the biological growth. In recent years, there has been an increased focus by government regarding the discharge of wastewater to the environment. Many municipalities have either no wastewater treatment facilities while others have facilities that are deficient or over capacity. Additionally, the implementation of new Wastewater Systems Effluent Regulations by the Government of Canada means that most treatment facilities across Canada will require substantial upgrades and retrofits. Traditional wastewater treatment technologies can be expensive for municipalities to obtain, while our focus is on technology that is proven, effective, and affordable. Click on the following links to find the solution that works best for you. For more information on advanced Wastewater Treatment through BioCord™ technology please contact Kevin Bossy or Christine Gan. To obtain a technical quotation specific to your project click here.